Here we go with an entry on the latest addition to my collection. I wonder if the grey paint or whatever it is that got spattered on the cover actually adds some character to it. Tammy is quite a few weeks into her merger with Sandie. 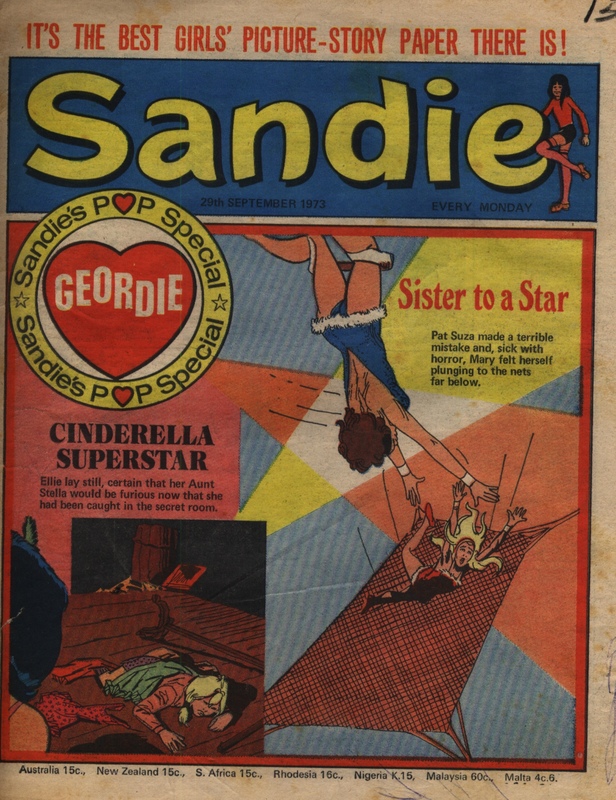 Although the Cover Girls were touted as Tammy and June (from the June merger) by the 1980s, their origins can be traced to the Sandie merger in 1973. Two-Faced Teesha, one of the stories that started with the merger, ends this week. Two-Faced Teesha finds her dad does not believe her when she says she is trying to turn over a new leaf, so she has one final round of spite before the girl she targeted in particular helps her to convince him. Miss Bigger gets an ally in her bullying of Wee Sue – new girl Sophie Scandel-monger. The name says it all, as do Sophie’s repulsive, weasel-like looks. But Sophie’s scheme against Wee Sue backfires so much that she gets a huge ticking off from Miss Bigger. That’s the end of that evil alliance, thank goodness. Uncle Angus stoops to whole new heights (or should that be lows?) in scrounging to save money. This time it’s at the cinema, much to the embarrassment of Jeannie and her aunt. And when Uncle Angus sets up his own cinema where he passes off his home movies as a blockbuster movie, Aunt Martha is so embarrassed she takes to her bed. However, once the audience catches on to what a cheap cheat Uncle Angus’ cinema is, they pelt him with his own vegetables from his garden. School for Snobs is a special school designed to cure girls of snobbery. The headmistress is Hermione Snoot, who wears a nightie and slippers with a mortar board, is seldom seen without a cigarette, and talks Cockney. This week Hermione’s in charge of curing a practical joker. I’m not quite sure what that has to do with snobbery, but turning the tables on the girl with practical jokes until she’s cured is right up Hermione’s street. After all, she pretty much does that with every snob every week. “The Chain Gang Champions” are kidnapped athletes. The Duchess subjects them to training methods that are as bizarre as they are sadistic. This week it’s finish gruelling cross-country training runs in record time – with ever-shortening time periods with each run – or the Duchess will feed her old enemy, the Minister for Sport, to a hungry bear! As if Pickering weren’t bad enough, Molly has a new enemy plotting her downfall. It is guest Cynthia Swingleton, who is after her fiancée’s money. Molly’s rumbled Cynthia’s game, so now she’s is trying to frame Molly for stealing! “Ballerina in Blue Jeans” impresses her ballet school with her dancing. Unfortunately her streetwise ways, like turning up at ballet school in a leather jacket and impersonating a motorbike rider as a demonstration of mime, have the teachers just about fainting. It’s not endearing her to the pupils either, and she has one spiteful enemy already. Well, whoever heard of a pupil in a ballet school serial who didn’t have one? “Granny’s Town” appears to be a take on ageism, but a very sinister one. “Her Ladyship” has become Mayoress of a retirement spot, Crone-on-Sea. She is introducing new measures that look suspiciously like they are striking at the young people of the town and putting old people on top. This week she has the police throwing young people in the nick for no crime other than they are not carrying one of Her Ladyship’s flags, unlike the elderly people. “It’s the orders of the new mayoress!” Gee, whatever happened to human rights in this town? John Wagner is known to have worked on girls’ comics and written girls stories in the 1970s. I didn’t know of any previous interviews which had focused on this part of his career in particular: many thanks to him for answering the questions below in this brief interview. 1 I’d love to know how you got started in writing for girls’ comics, and what you did during that part of your comics career. What stories did you write? How did you balance writing comics alongside being an editor – or was that all part of what the editor was expected to do? 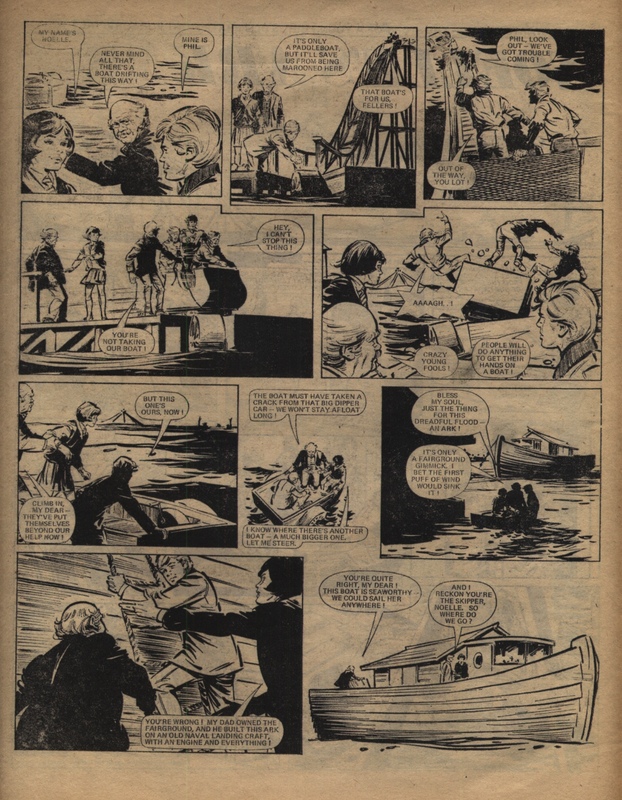 The girls’ comic side of my career started with Romeo, the DC Thomson romantic comic/mag, the poor sister of Jackie. Girls’ romance was just a step up from normal girls’ fare with the addition of boys. We never touched on lesbian love back then! Then when I left to go freelance with Pat Mills, girls’ stories was one of our target markets. We were given “School of No Escape” (was that in Sandie or Tammy? [that was in Sandie]) by the managing editor, John Purdie. The story had already been started, was running, but either the writer had quit, or been sacked. In any case editorial didn’t know quite how to handle it. It was quite a challenging first assignment but we made a pretty good fist of it. I helped Pat devise “School for Snobs” and write the first couple of episodes before we split up and I went to work in the IPC office in London. My only girls’ comic story after that was “Jeannie and Her Uncle Meanie”. 2 We’re always on the lookout for information on other creators of girls comics from the time. I have already asked you for any suggestions on the name of the artist on “Slave of the Trapeze” and “School of No Escape”, which sadly for us you weren’t able to recall. Are there stories by other people that you particularly remember from that time, which you would be able to help us to credit the creators on? For instance, anything written by any of Gerry Finley-Day, Malcolm Shaw, Charles Herring, Jay Over, Ian Mennell, Benita Brown, Maureen Spurgeon? Malcolm Shaw was my sub on Sandie for a while, quite a good, reliable one. I’m afraid I don’t remember any particular stories any of the people you mention wrote, though Gerry would have done two or three for me. Never heard of Jay Over or Benita Brown and assume Maureen then went by another surname that I can’t remember. 3 Pat Mills has fond memories and a lot of respect for specific girls’ comics titles and the hard-hitting gritty stories that ran in them. What kind of comparisons would you draw between the world of girls’ comics and that of the boys’ titles you worked on? They were pretty different, up until Pat and I started work on Battle Picture Weekly. 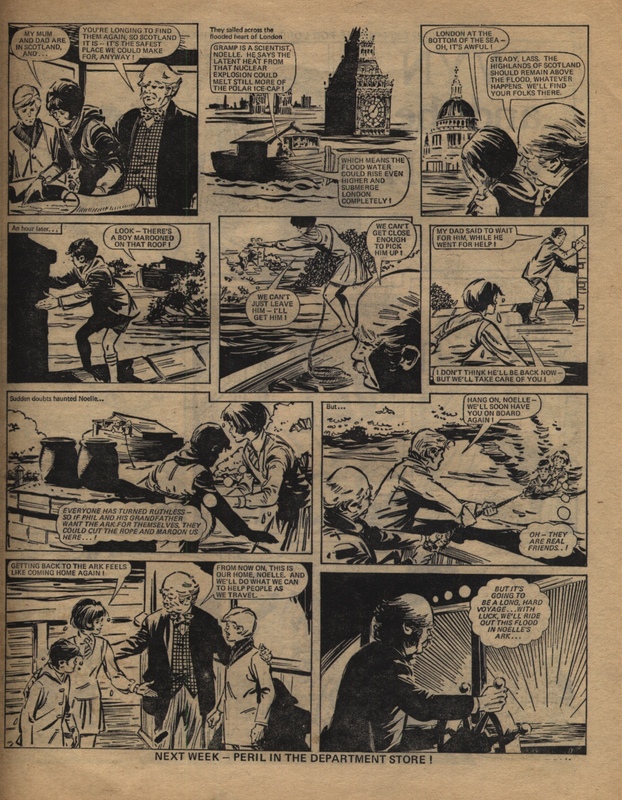 I refer to the IPC boys’ stories, as DC Thomson boys’ comics had some excellent stories and were almost the equal of their girls’ titles. But IPC boys’ titles had stagnated, with stories that were formulaic, repetitive, barely credible and carried very little emotional power. They paled in comparison to the stories in Judy, Mandy and especially Bunty – clever, meaty, affecting. 4 You started your comics career working for DC Thomson before moving south to IPC/Fleetway. 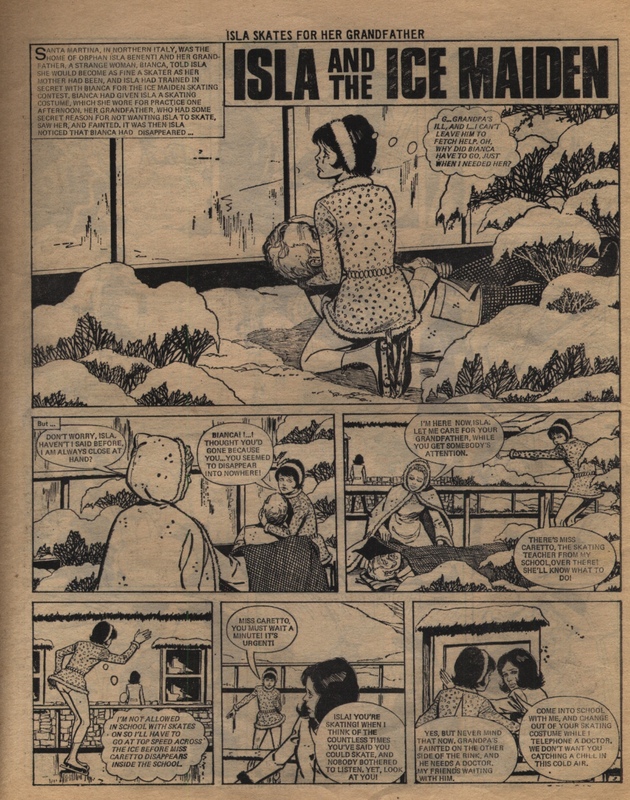 Were there things about creating comics that you learned at DC Thomson which you were keen to bring with you to IPC, or perhaps keen to move away from? Or other memories of differences between the two publishers? I was keen to move away from poverty! The key lesson I learned there was self-criticism. Nothing you write can’t be better. Always question yourself – am I getting the best out of that scene, those characters, is there a better way of doing things? 5 Finally, anything you can tell us about your time at Sandie would be good to know. It was a fairly short-lived title, only lasting for 89 issues. What do you think that was down to? Did you leave it as it finished, or earlier? Who else worked on it that you can recall? My memory is that they closed it down – or merged it – on a circulation of about 180,000 (though that figure may be inflated in my mind). In any case the low cover price meant that they had to sell enormous numbers. I was told the comic was going under and that they wanted me to move on to Princess Tina (which was also dying) and revamp it in an attempt to save it. Norman Worker (I think) was brought in to see Sandie laid to rest. In turn I made an awful hash of Tina, whereupon I quit journalism to become caretaker of an estate in Scotland, never to return (I thought!). I’ve already mentioned [in email] some of the names of Sandie staff – subs Kyra Clegg, Rhoda Miller, Malcolm Shaw. Ally McKay was assistant art man for a while, and John…John…ah, I forget, but he was art editor. Many thanks again to John Wagner for this interview. 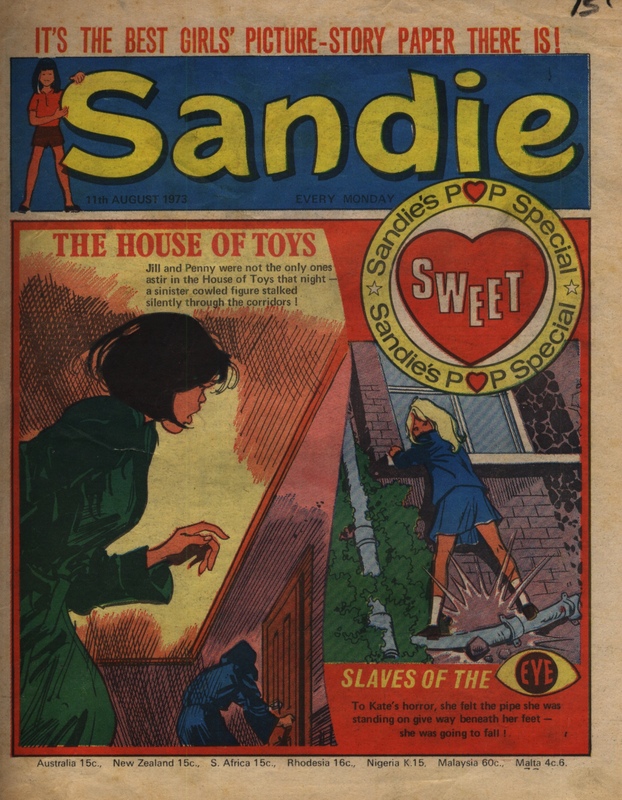 I have a small number of issues of Sandie, which I looked at in this post. 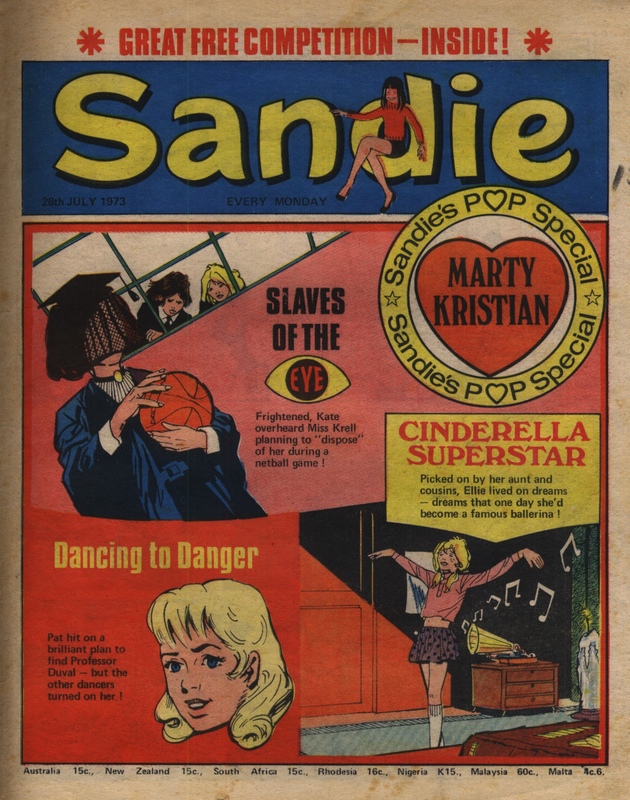 Catawiki has details on a few Sandie issues also, and the Great News for All Readers blog has posted in detail about two issues in 2016. 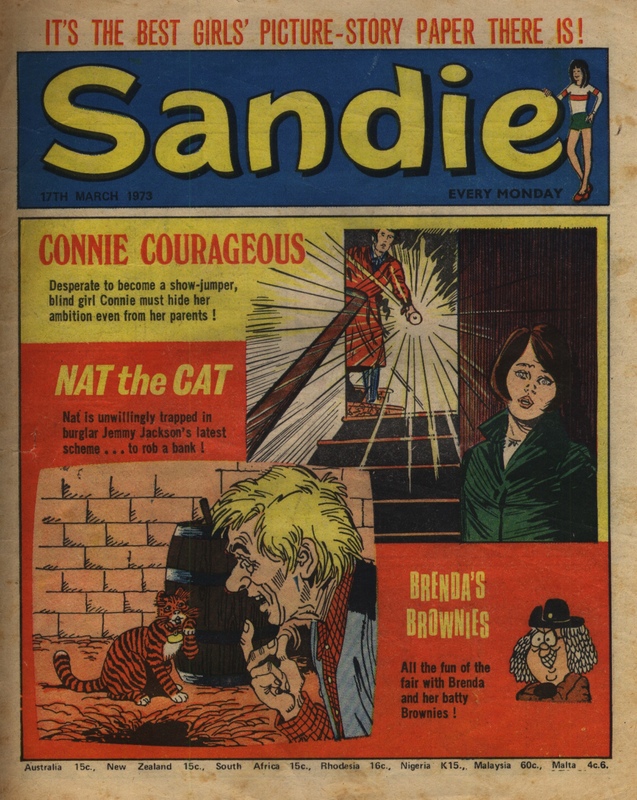 Mistyfan also wrote a post about the advert for Sandie’s launch, and another on issue 7 of Sandie in 1972. 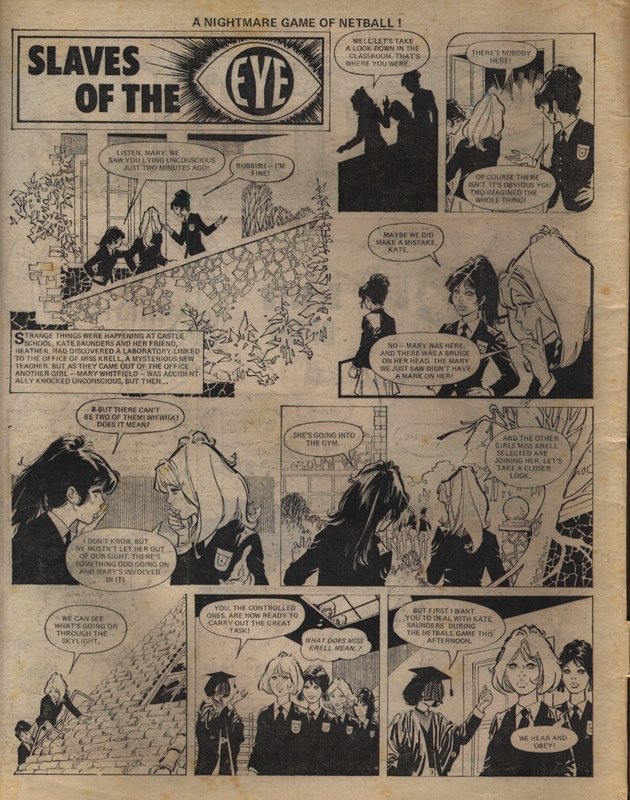 Pat Mills is someone who has already contributed lots to our knowledge of girls comics of this era, but even so there are still some gaps in our knowledge of what he wrote, and always plenty more questions to be asked. With thanks to him for his contributions now and in the past, here is a brief email interview. 1) In previous discussions you’ve identified the following stories in girls’ comics as having been written by you. Are there any stories missing from that list that you can remember? Some other stories have been attributed to you – also listed below – which you’ve either specifically said you didn’t write, or which haven’t been included in those previous discussions. It would be great to clarify this once and for all, if we can. You have also said before that you wrote a horse story, without identifying which one it was. Might it be “Horse from the Sea”? Or perhaps “Wild Horse Summer“? Pat Mills: No. Doesn’t ring a bell. It’s possible I did the horse story for Tammy, but it wasn’t very good. Pat Mills: Charles Herring wrote Ella which I hugely admire. I wrote Glenda. Also – Aunt Aggie, School for Snobs, and Granny’s Town, but not all episodes. Pat Mills: Think “Red Knee” was mine if it was the spider story. Also “Hush Hush Sweet Rachel” – art by Feito. And some Jinty stories you didn’t write but which are often attributed to you: “Knight and Day” (now confirmed as not yours), “The Human Zoo” (I think this is thought to be Malcolm Shaw’s), “Wanda Whiter Than White“, “Guardian of White Horse Hill” (you’ve previously thought this is likely to be Malcolm’s too). Pat Mills: No, none of those are mine. John Wagner created and wrote “Jeanie and her Uncle Meanie” for Sandie, I think. John was an editor on Sandie, but Gerry was the founding editor. I wrote “Captives of Madam Karma” in Sandie. John Wagner and I wrote “School of No Escape” in Sandie. (That was not bad) And “The Incredible Miss Birch” for Sandie. (Not our finest hour!) And I must have written at least one other story of this kind for Sandie. I also wrote “Sugar Jones” and other stories for Pink, and “9 to 4” for Girl. 3) In Steve MacManus’ new book on his time in IPC / Fleetway, he talks about stories being measured in terms of the number of panels in the story: so for instance at one point he refers to a ‘twenty-two picture episode’ and at other points to a ‘thirty-picture script’. Is this something that you too remember from your time at IPC Fleetway? Did it happen at DCThomson too? I was interested in this because it seemed like a surprising way to think about comics, rather than in terms of page count. Pat Mills: Yes. Steve is spot on. It’s a big subject. A thirty picture story in girls comics would theoretically deliver a lot of story. But it would be crammed and old fashioned. So I changed all that on 2000AD with less images on the page and started to apply it to Misty. 4) You’ve talked before about girls comics working differently from boys comics, and Steve MacManus recalls you saying that in a girls story the heroine would beat a bully, ride in a gymkhana, and still get back home in time to make her motherless family a hearty tea. Clearly girls comics were very full of plot! And you were a big part of rewriting a bunch of boys stories to make them fit the girls comics model more closely. Can you talk in a bit more detail about how this worked, in other words, what the mechanism was, more exactly? Is it a case of using fewer action sequences, more surprise reveals, lots of scene changes…? Pat Mills: The big principle of girls comics that I applied to boys comics was “emotion”. Sometimes this worked well, but it needed applying in a different way. More “cool”, perhaps. Some girls principles didn’t adapt well: jealousy for instance. Girls loved stories involving jealousy – boys didn’t. Hence “Green’s Grudge War” in Action wasn’t a hit. Similarly, mystery stories work well in girls comics, boys didn’t give a damn about mystery. Hence my “Terror Beyond the Bamboo Curtain” in Battle, boys didn’t care what the terror was. It wasn’t a failure, but not the hit we hoped for. However, where girls comics scored ENORMOUSLY was in having realistic stories that didn’t talk down to the reader. My “Charley’s War” is really a girls comic in disguise. Its popularity lies in it applying girls comic principles NOT boys comic principles – e.g. emotion is allowable in the context of World War One. I was never that sold on “girls adventure” where there wasn’t a strong “kitchen sink”/Grange Hill factor. I think when Jinty went in for science fiction adventure it led the field, but not so sure about regular adventure which could seem “old school” – to me, at least. This was a factor everyone battled with on girls and boys comics, avoiding “old school” and creating stories that were “cool”. Thus I would describe “Cat Girl” in Sally as uncool and old fashioned. Some of the Misty stories fell into that category – historical stories, for example. Many thanks again to Pat Mills for his time, and for his memories and thoughts on this. 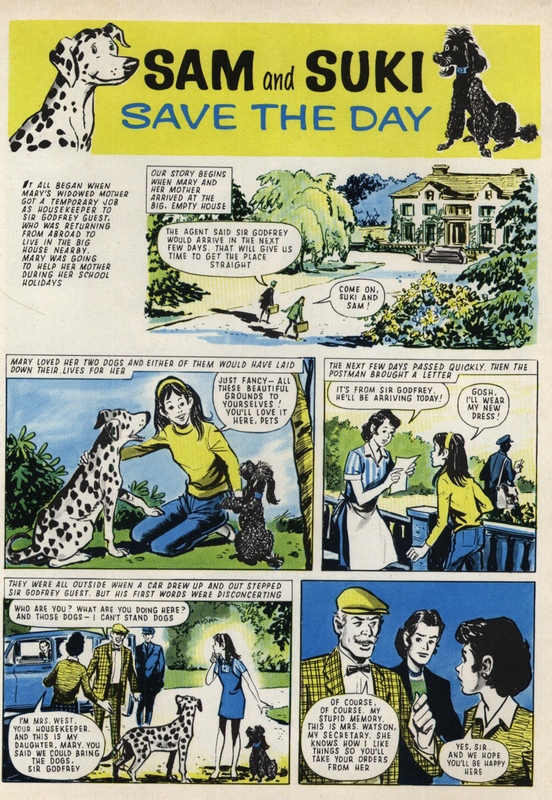 Robert MacGillivray (1913 – 1986) was the artist on only one ongoing Jinty story, though his art also appeared in a number of annuals (often in reprints from other older titles such as June), and so he was more familiar to the Jinty reader than other artists who did only a single strip or two. He had a classic comedy style, with big noses and bizarre contrivances seen in strips such as “Jeannie and her Uncle Meanie”, “Lucky’s Living Doll”, and “The Flights of Flopear”. Jinty‘s “Desert Island Daisy” was a strip done in this ‘big nose’ style too, but Jinty readers also saw some more realistic stories on occasion. The post about the June book from 1970 includes mention of MacGillivray, where he used a slightly more realistic style. I am using that as the example page for this artist, to show a little of his range. 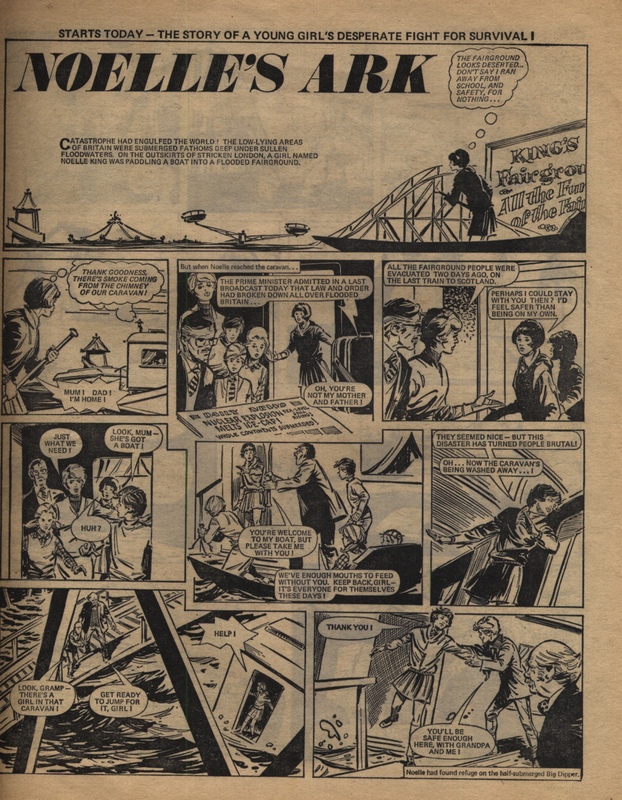 The Girls Comics of Yesterday site includes a tag for Robert MacGillivray, so do check there to see what stories he drew for DC Thomson. Likewise the Tammy Project includes “Maisie’s Magic Eye“, drawn by MacGillivray and published in Sally (reprinted in Tammy). He also drew “Wee Sue” at points in this long-running character’s life; these are mentioned in the posts on this site about the Tammy annuals in 1984, 1985, and 1986. The Comics UK forum includes a discussion thread specifically about MacGillivray, with much information about early work of this prolific artist.